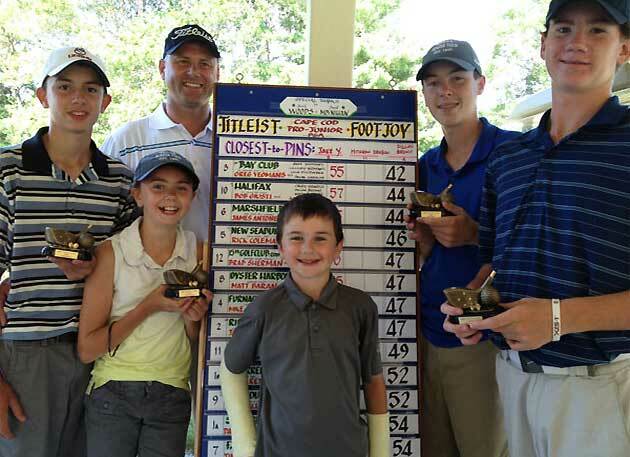 Bay Club Claims Victory in the Titleist/FootJoy Pro-Junior! Head Golf Professional Greg Yeomans led his team to victory in the Titleist/FootJoy Pro-Junior held Tuesday, July 22 at Squirrel Run Golf Club in Plymouth, MA. The fifteen team field competed in a Best-Ball between the pro score and the team scramble score. The Bay Club team shot an amazing -15 under par round with 11 consecutive birdies all coming from the juniors. Team members included Jake Yeomans, Cassidy Yeomans, Greg Yeomans, Jason Gamache, Collin Fitzpatrick and Braden Yeomans (on the DL). For the complete story, please click here. Way to go team!